LONDON (Reuters) - Britain's richest man Jim Ratcliffe rode to the rescue of Team Sky when the chemicals billionaire was confirmed as the new owner of the powerhouse cycle team on Tuesday. The Pittsburgh Aviation Animal Rescue Team saved its 10,000th animal on Saturday; KDKA's Meghan Schiller reports. 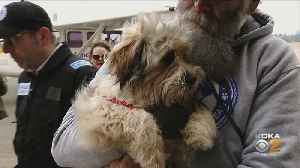 The Pittsburgh Aviation Animal Rescue Team saved its 10,000th animal on Saturday.